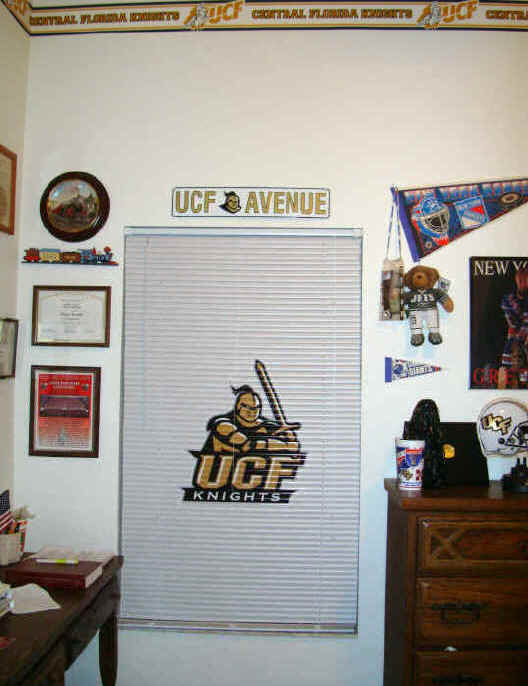 The Only Place to "Sport Up" Your Doors & Windows! 100% Satisfaction Or 100% Refund On Every Order! We take the Ordinary windows and doors and make them Extraordinary for you! Just A Few Of Our Satisfied Customers Who Chose To Share Their Room With Us! I received my blinds today and of course installed them right away. My wife and I are very pleased. She posted a picture of the one with my granddaughters on Facebook, and everyone is asking where to get one. We cannot of course make anyone buy one but we will always recommend you. 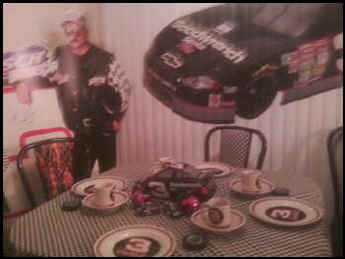 Thanks for the great product as well as the service during the picture selection process. Here ate the pictures of my blinds installed. They look great, good work it was a nice finishing touch for my shop. Thanks again. Spread the word about Sportyblinds! 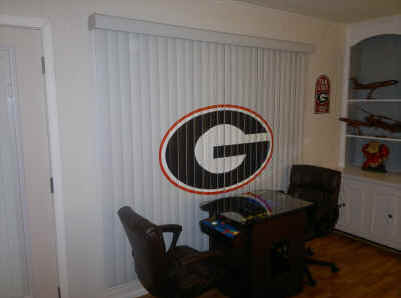 Here is a better picture of the blinds. Again, thank you so much for making this order for me. I will definitely refer you to everyone I know! Melani - from Pensacola, Fl. 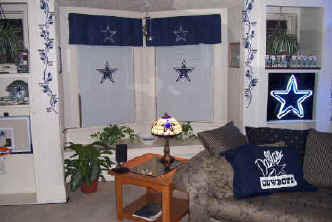 The Boys Love the Packers Blind, It brings the Man Cave to Life! Cory - from Everett, Pa.. Outstanding Speedy Service and A Perfect Fit! Eric - from Lancaster, Pa.
Great news! I'm excited to see the end result when I display it proudly in my gym. I'm going to pass your name and company along to others in my school district (We have 27 other elementary schools). I'm sure once people see the end result, you'll be receiving more inquiry emails from Longmont! Thanks again for your timeliness and professionalism through all of my questions! It's been a pleasure working with you and I want to share what the product looks like in my office space! My best to you! Thanks so much! 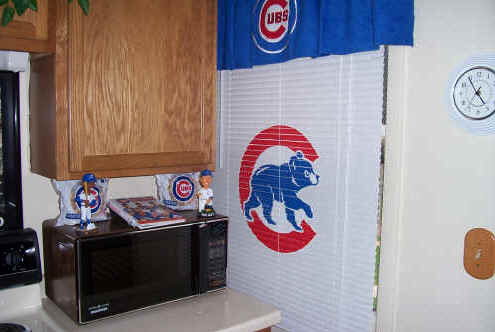 Thank you for the great blinds! We want more, sending you pictures now! Robert - from Middleville, MI. Robert - from Spokane Valley, Wa. My client loves them! Thank you for your patience and superb work! Susan - from Chevy Chase MD. Mark - from Lancaster, Pa.
"Jeff, It turned out great! Everyone is pleased with the results. Thank you for your professional and quality work!" 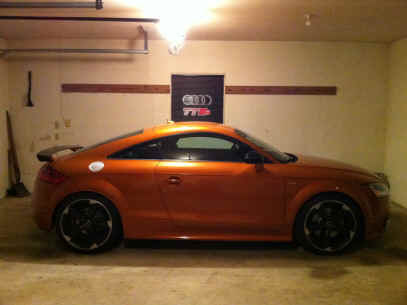 "Tops Off my Garage Perfect!" Excellent Job, Thank you! Scott claims some people think he is over the top! I think the Pittsburgh Steelers Blinds put him at the top! -Dawn and Jerry- from Pasadena MD. The blinds arrived late this afternoon. The fit and logo are perfect. 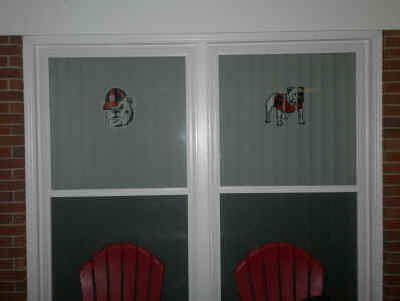 Couldn't wait for the boys to see them when they came home this weekend, they thought the blinds look great! Mr. Sparks from Anderson, IN. 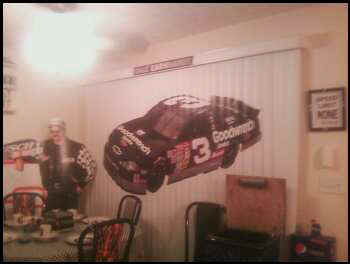 Jeff, I got the blinds, got them up, they look awesome and really put a good finishing touch on the room. 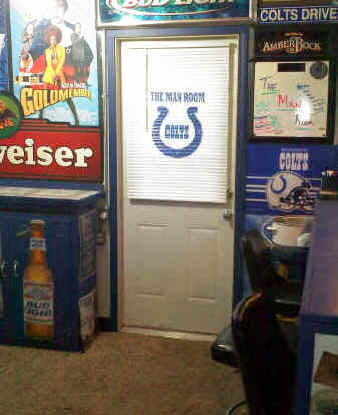 Thank you so much, it is well worth the price and i will spread the word for all man caves in the future. Josh from - Port Saint Lucie FL. Justin & Amanda from Lansing MI. 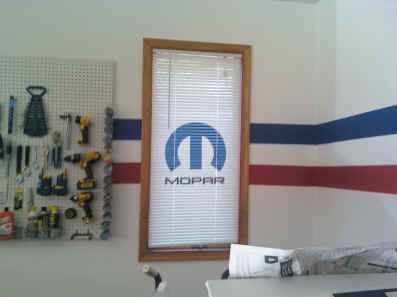 Independently Owned And Operated Two Men And A Truck Franchise logo on both sides of a vertical blind. Not only that but there was a window divider in the center of the widows they need covered. "Thanks for your patience throughout the order process. Your customer service has been impeccable." Mark is a big-time Deer Hunter all across Pa. 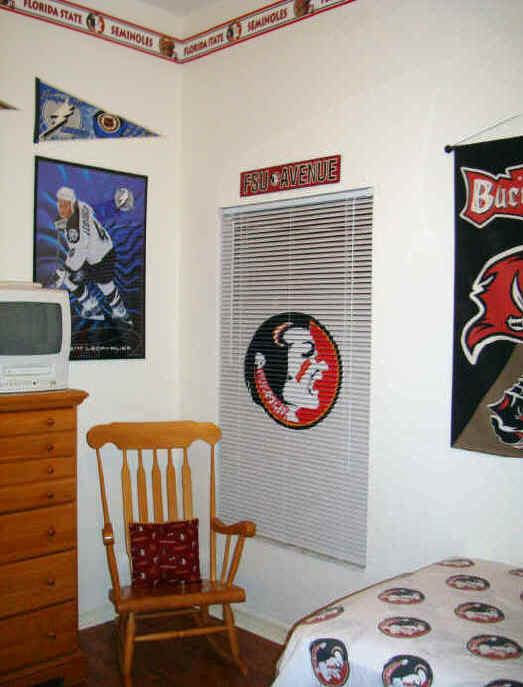 The Sporty Blind he decided to go with matches his Big Game Mount Room Nicely! His Wife was against the idea at first but I hear she is warming up to the nice 10 point addition to his collection. To say I am "happy" with the mini-blinds could, quite possibly, be the understatement of the century!! I absolutely LOVE the mini-blinds that you created for me! 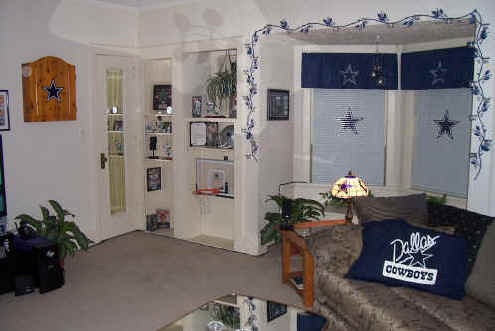 They are the PERFECT accent to the rooms that I "Sported Up"!! (Made me wish I had more windows around this place! *lol*) Seriously, I don't know how I could be any happier with the quality of the product. You did a fantastic job! 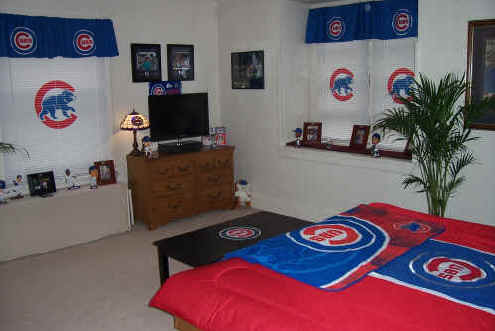 I might consider ordering some Chicago Cubs mini-blinds from you, in the future. (Hold the presses on that order tho....Mr. Visa, Mastercard, and American Express are not talking to me lately! *lmao*) I have (and will continue to) spread the word about your business and how much attention to detail you take with every order. In fact, I'm kind of surprised that you haven't received any orders from some of the "clan" in this area. I would be happy to send you some pics showing off your fine craftmanship! UPDATE! 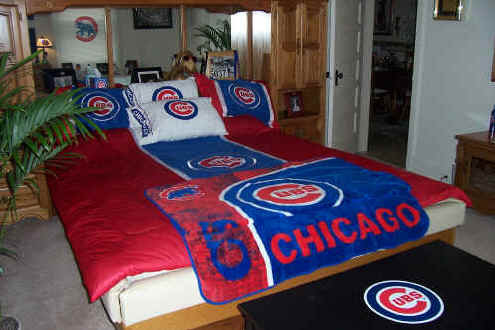 Here is Rick's Chicago Cubs Room, (or should I say Rooms)... Thanks Ricker! 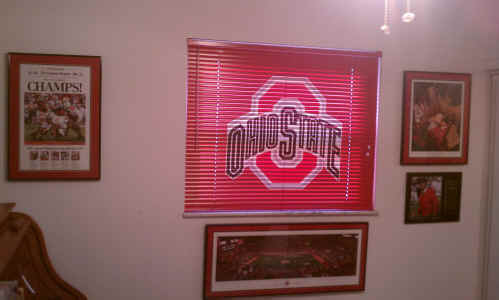 Jeff, I just received my red Ohio State blind for my buckeyes room, I got it up and it looks great! I want to thank you for doing such a fantastic job on it! Again Thank you very much. 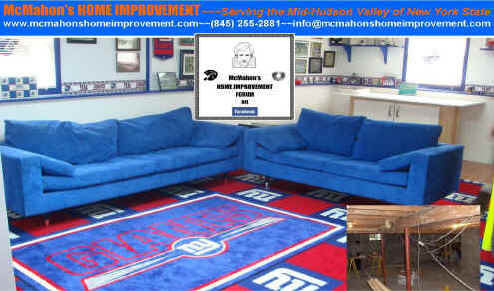 ï¿½We have some rabid Giants fans in NY and a recent basement remodel project for a client of our company, McMahonï¿½s Home Improvement in New Paltz, New York, showed just how devoted our client is to his team. 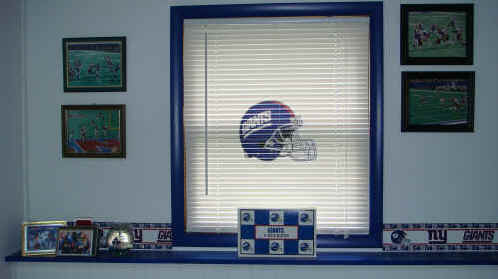 In this basement to media room (man room) conversion, the custom blinds with the Giants logo & helmet gave just the right finishing touch to the project. Our customerï¿½s friends howled with delight when they saw them. 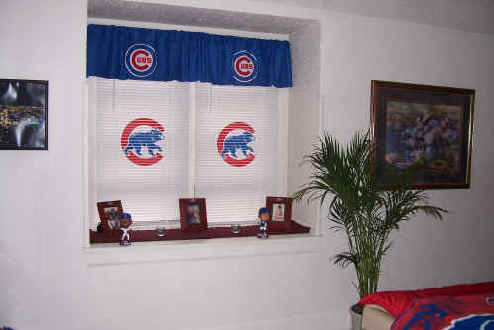 Thanks to Sporty Blinds for making our client just that much happier! 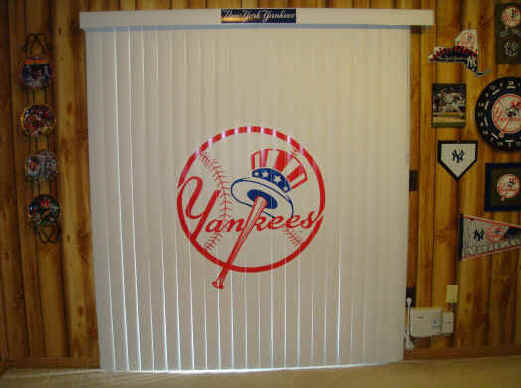 I love my New York Yankees blinds! away and sent it to her Mom in Florida. Thank you again for the Great Blinds and Great Service!! Just wanted to share how beautiful it looks!! 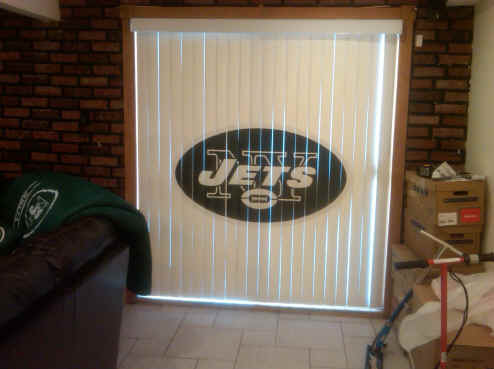 My Room is now complete with a great blind from www.Sportyblinds.com. 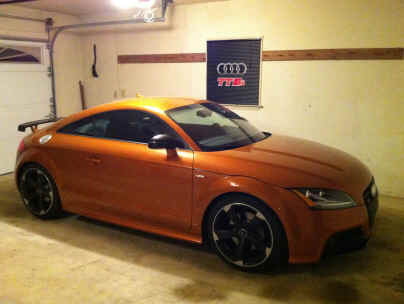 It looks awesome and all my friends love it! 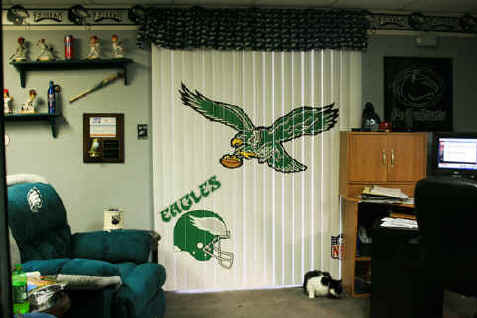 The Old style Eagles Logo adds just the right touch to mix all my new and old Eagles paraphernalia together! A Harley Davidson Garage "Sported Up"
They Look Great! Thank you! I got them Friday and got them up already. It is beautiful I love it. Thank you so much I added you to my favorite sellers list! I love the blinds very much. I get alot of compliments on them. I tell everyone let me know if they want any and tell them about you. Thanks! We hung these blinds in the office so that the image is facing out the window for people walking by too see, we have received many compliments on the blinds, Nice Job! 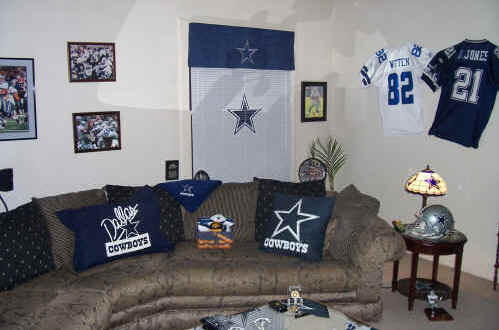 This was my Eagles Nest before I "Sported Up" The blinds. I could not find anyone who sold blinds with my beloved "Birds" on them so I had to make my own, once my family and friends saw them, Sporty Blinds was started. 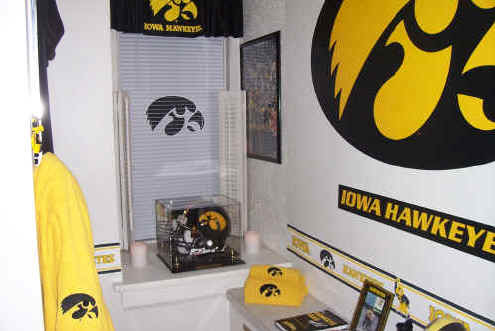 I have been helping people "Sport Up" their rooms ever since. Roll your mouse over the picture to the left to see the AMAZING transformation Sporty Blinds did for this room and what it can do for you. Thank you to everyone for your business!